Here we illustrate how hypothesis testing is done with Torah codes by small simulated data sets in which what is going on can be entirely visualized geometrically. 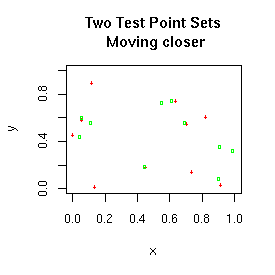 The first simulations will be with two two-dimensional point sets, one point set associated with the ELSs of one key word and the other point set associated with ELSs of the other key word. 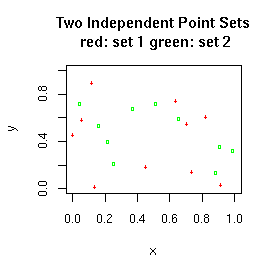 The Null hypothesis is that the interpoint distances between the points of the first set and the second set are just what would be expected if the points in each set were uniformly distributed in the unit square and independent of each other. The Alternative hypothesis we first choose to examine is that one point from the first point set and one point from the second point set are closer together than what would be expected under the Null hypothesis. What should our test statistic be? How should be choose its critical value?